"Can be eaten cold so this is ideal for Shabbos lunch. Leftovers can be used on salads or for sandwiches. Need to be attentive to stove for 30 minutes." Place chicken between 2 sheets of heavy plastic on a solid, level surface. Firmly pound chicken with the smooth side of a meat mallet to an even thickness. Whisk egg and water together in a bowl. 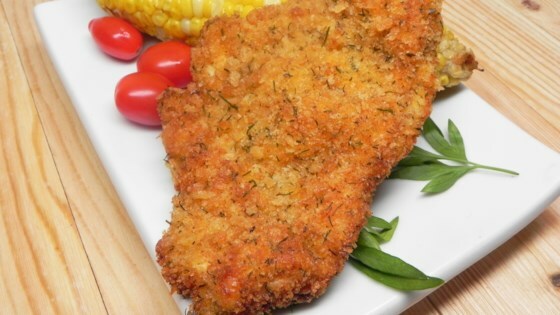 Mix panko bread crumbs, lemon pepper, and dill weed together on a flat dish. Dip chicken pieces in egg mixture. Dredge in panko mixture until coated. Coat a large skillet with cooking spray; preheat over medium-high heat. Cook chicken pieces in batches until golden brown, about 5 minutes per side. Drain on paper towels. Sprinkle lemon juice over each piece of chicken. Salt, onion powder, garlic powder, paprika, dried parsley, and herb seasoning could be used to season the bread crumbs instead. Use a skillet large enough to cook chicken pieces without teaching. Very simple. You have to watch it because there’s a fine line between burning the coating and drying out the chicken. Medium heat will help and prep is fast so be patient.